These days, it seems like we Americans spend the majority of our time screaming at each other. There’s been a lot of talk about a lack of civility, a lack of respect. There’s a feeling of a yawning chasm that, every day, gets a little wider. There’s a feeling that we’ll eventually be swallowed by it. You know what? I’m part of the problem. I wish it weren’t so, but it is. Just this last May, President Donald Trump referred to some undocumented immigrants as “animals” who would be removed from the United States “at a rate that’s never happened before.” My first mistake? Deciding to get into an argument online about this subject with a man who was a complete stranger. Sure, he was using language that I thought was inflammatory toward a friend of mine. Sure, I thought I would step up and teach this guy a lesson. This particular road to Hell was paved with all kinds of good intentions. How, exactly, did I teach him a lesson? Did I engage him with decency, and assume his motives were as decent as the ones I thought I had? Nope, not even close. I accused this man of being a coward. I sneered at him, and was as condescending to him as it humanly possible to get. The last word in the argument was mine, and I thought to myself, “I won.” On the heels of that thought was another. I can’t say if it was my conscience, or God, or something entirely other. It was very quiet, and very small. Mr. Rogers would be so disappointed in you. Why that particular thought, about that particular man? 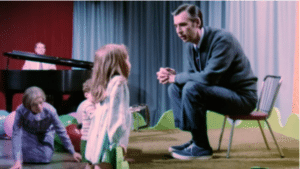 I’d seen a trailer for a new documentary, Won’t You Be My Neighbor, about the life and work of Fred Rogers. It’s a simple and powerful film, about simple and powerful ideas. I’m sure you’ve heard the rumors, that Rogers wore those sweaters to cover an extensive collection of tattoos*, or that his placid demeanor concealed a fiendishly deadly sniper who served in the Vietnam War. The truth is alternately simpler and more complex. His original plan was to enter the seminary and become a Presbyterian minister. He would have excelled at it, but he saw the ascension of television and saw its potential as a tool for children. Much like now, the majority of children’s television was loud, slapsticky, and violent. Much like now, Rogers had a solution that was quietly revolutionary. 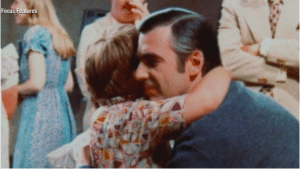 Beginning in 1968, Rogers was the host of Mr. Rogers’ Neighborhood on PBS. The show looked like it had a budget of about fifty dollars. Through puppeteering, songs, and a belief in clear and respectful communication with children, Rogers became an icon. Directed by Morgan Neville, Won’t You Be My Neighbor charts the growth of Fred Rogers and his place in the American fabric. A different kind of documentary would have shown celebrities discussing the impact of the show. There’s a little of that with musician Yo-Yo Ma, where he admits Rogers, “scared the hell out of me.” The majority of interviews are with people involved in the making of the show, and they effectively let us see Fred Rogers’ point of view. When we think of Fred Rogers, we think of a man who’s quiet, thoughtful. We don’t often associate him with willpower. 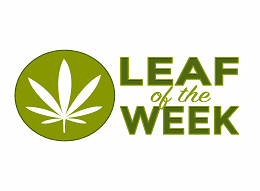 His puppets were an extension of his personality, and while Daniel Striped Tiger may have been his inner child, it’s the benevolent despot King Friday who was the guiding force of his show. While segments with Joe “Handyman” Negri seem like the making of Mr. Rogers’ Neighborhood was a rambunctious party, there’s a sense underneath that Rogers expected and received unyielding control over the tone and direction. As the film moves through the history of the show, there is no shortage of astounding moments. We see clips from an episode directly dealing with the assassination of Robert Kennedy, and a clip from the first week on air where King Friday wants to build a wall to protect his kingdom from “undesirables.”** There’s a sequence with Francois Clemmons, who played the character of Officer Clemmons. As an African-American actor, Clemmons understood the power of a friendly black man playing a police officer, and we see Clemmons and Rogers wading in a kiddie pool together, while footage is intercut of a white man pouring bleach into a public pool where black children are swimming. The visual of Clemmons and Rogers bare feet together is quiet, and it has the power of a thunderclap. What would Rogers make of our modern landscape? He was a registered Republican, probably the most beloved member of the GOP since Lincoln. Before that, he was a humanist, a believer that every person has value. After the attacks on 9/11, he was asked to issue a reassuring statement for America’s children. Like the rest of us, Fred Rogers confronted the horror of 9/11 and felt daunted by it. He doubted his words would have much of an impact, and I suspect the words to the Breton Fisherman’s Prayer, “Oh, God, thy sea is so great, and my boat is so small,” must have run through his mind. During an early interview segment, Rogers says, “Love is at the root of everything. 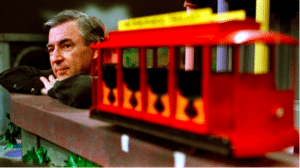 Love or lack of it.” With Won’t You Be My Neighbor, Morgan Neville’s documentary reminds us that Fred Rogers life and work was not about telling children that they were winners, or that they were special. It was about reminding them that they matter, just as they are. It was about reminding us that we have an enormous capacity for love and kindness, and all we have to do is use it. As you might imagine, this is an emotionally intense film. As I walked out, trying to hide my tears from the other patrons, I made a little promise to myself. In the face of hate and negativity, I’d make a little more effort to be kind. In times of despair, kindness can seem pointless, like trying to light a candle at the bottom of the ocean. We might wonder what Mr. Rogers would do today. The better question? What are you going to do? *There’s a scene of Rogers swimming laps, and I have to wonder if one of the reasons for it was to debunk the tattoo rumor. **It bears mentioning that King Friday’s wall ultimately came down due to civil disobedience. ***You can watch the footage here. It’s a truly extraordinary moment, and I wonder how the same moment would go over today.